The stylish India caption was the third visiting team batter to fall in the first session of the opening day. A disciplined Australian bowling dismantled India’s opening order batting in the first innings of the first Test match, but it was Usman Khawaja who stole the thunder due to his brilliant fielding on Thursday. On Thursday, in the 11th over of the match, Pat Cummins was brought into the attack by Aussie skipper Tim Paine. Rewarding the faith of his captain, the bowler produced an edge off Virat Kohli’s bat. 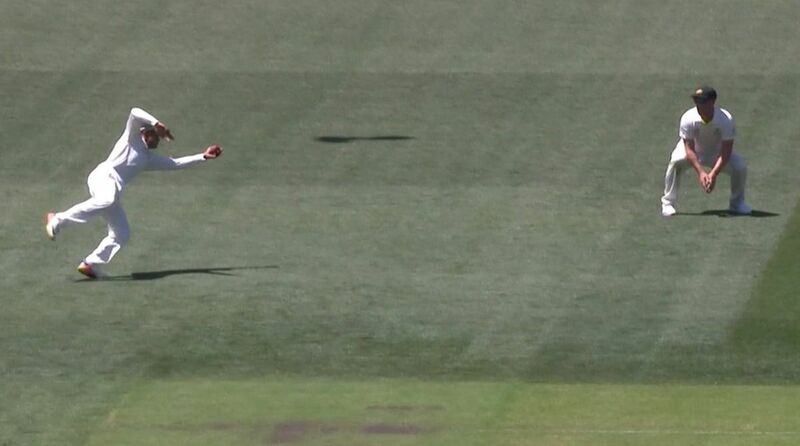 After touching the edge of Virat Kohli’s bat, the ball went flying towards the slip and Usman Khawaja took a flying one hand catch to dismiss Indian skipper. The stylish India caption was the third visiting team batter to fall in the first session of the opening day of the match after Josh Hazlewood and Mitchell Starc got rid of KL Rahul (2) and Murali Vijay (11), respectively. After winning the toss, Virat Kohli opted to bat first, however, the decision to soon backfired as India lost four wickets before lunch.